Micro companies (often defined as having less than 10 employees) are the smallest of ventures, often just starting up. 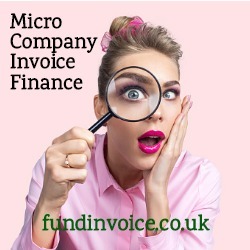 I had a conversation with a new selective invoice finance company that are going to target just micro companies, with a maximum level of funds in use of just £30K. This is not a segment of the invoice finance market that is being addressed by most funders. If anything, we have seen funders increasing their target deal size, moving upwards towards ABL (asset based lending) propositions in some cases. Thankfully, there are still some options for smaller organisations, and new startups. This particular provider is offering a micro company factoring service, that means that in addition to provided funding at up to 90% of invoice value, they will take on the task of credit control and collect in the invoices for their clients. This can create a big time saving as the prime mover or movers of the business don't have to undertake this task, and can focus on growing their small business. So in addition to the provision of micro company invoice finance, the other good news for customers is that this particular provider is not seeking a personal guarantee from the company's directors as a matter of course, nor do they insist on customers being homeowners. This will be welcomed by many small company directors that don't want to risk their personal assets, or home to support their business borrowing. There are now several options for small companies within the receivables financing sector. These are both on a selective invoice basis, as in this case, and there are small company whole turnover arrangements available, although these may be subject to a minimum fee linked to projected turnover. If a company is looking to maximise their funding over a longer period of time, whole turnover may be a preferable option. Whereas selective facilities are often favoured where there is a need to get a company over a short term funding gap. Please call Sean on 03330 113622 if you need help finding invoice finance, or factoring for a micro company. Does Your Invoice Finance Company Still Want You? Who Is The Best Invoice Finance Company? Has Your Factoring Facility Been Reduced? Are You Getting Bad Service From Your Factoring Company?